The Modified Consent Decree (MCD) for Baltimore City’s sanitary sewer system was entered on October 6, 2017. The MCD requires additional rehabilitation to address sanitary sewer overflows (SSOs) from the sanitary sewer system. SSOs may have multiple causes, including infrastructure failure, roots, or clogs in the sewer system. The rehabilitation effort involves cleaning, repair, and/or replacement of public sewer infrastructure and will be conducted over two (2) separate phases. Phase I is expected to eliminate 83% of SSO volume by January 1, 2021. Phase II will include additional necessary sewer rehabilitation projects that will be designed based on the impact of Phase I. The Phase II capital projects will be completed by December 31, 2030. The Department of Public Works performs water quality monitoring throughout Baltimore City and publishes the results online. An overview of these programs and historic sampling data is available here. What is the Sanitary Sewer Consent Decree? 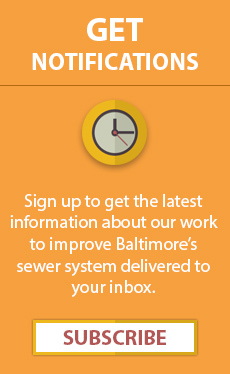 The Sanitary Sewer Consent Decree is a settlement, approved by a federal judge, which formalizes an agreement between the U.S. Environmental Protection Agency (EPA), the U.S. Department of Justice (DOJ), the State of Maryland – Department of the Environment (MDE), and the City of Baltimore. The Consent Decree requires the City to address overflows from the City’s sanitary sewer system. Why does the sanitary sewer system overflow? Sewers can become clogged by tree roots, grease, or other items that should not be flushed down the drain (e.g., wipes, diapers, plastic products, paper towels, etc.) Sewers can also develop cracks and breaks, which cause stormwater and groundwater to infiltrate the sewer system during wet weather. Finally, sewers can fail due to deterioration. These problems can cause sewers to overflow into waterways or even back up into basements. How is the City planning to address SSOs? The Consent Decree prescribes a number of programs and construction projects that address SSOs and allow the City to close its structured overflows safely. The City is repairing or replacing broken or leaking pipes and other sanitary sewer structures; increasing the capacity of sewer lines by upsizing pipes and building storage facilities; constructing the Headworks project at the Back River Wastewater Treatment Plant to eliminate a hydraulic restriction in the sewer system; and implementing proactive inspection, cleaning, and enforcement measures throughout the sewer system. Keep grease out of the sewers. Dispose of greasy and fatty foods, such as salad dressings, cooking oil, ice cream and sauces, in your garbage can instead of your sink or garbage disposal. Eliminate direct connections of roof leaders and sump pumps to the sanitary sewer system. Make sure there are strainers over all floor and sink drains. Do not plant trees or bushes near sewer lines – the roots from these plants can cause extensive damage to sewer lines. Do not flush rags, wipes, diapers, napkins, personal hygiene products or similar products down the toilet or drain –these are a major cause of backups and overflows. Have the line that connects your house with the public sewer line (called a sewer lateral) inspected, and install an external cleanout to provide access to your sewer lateral. Repairing broken laterals, which is the homeowner's responsibility, can keep stormwater from leaking into pipes, eliminate root intrusion, and prevent sewer backups into your home. Guidelines to help prevent sewer backups are available here. Keep people away from the area of the overflow (typically a manhole). This is especially important for children and pets that may play near the overflow area (e.g., streets, public parks, or local streams, creeks, and rivers). Do not go near or touch the overflow. If you do happen to come in contact with the sewage overflow, wash your hands thoroughly with warm soapy water before handling food or touching other persons or surfaces. Wash all clothing that came in contact with overflow. What is a private sewer line? Does the City repair private sewer lines? Your private sewer line is the underground sewer pipe that connects your plumbing to the public sewer system. The City does not repair or maintain private sewer lines. Property owners are responsible for replacing, maintaining, and repairing sewer pipes in their buildings and within their property lines. Do not plant trees, shrubs, or bushes near sewer lines. Roots from these plants can enter, block, and damage sewer pipes. Do not dispose of fats, oils, or grease down sinks, toilets, or floor drains. Dispose of them in the trash instead. Fats, oils and greases (FOG) solidify inside drains and sewers and eventually create clogs. Do not dispose of diapers, napkins, wipes, rags, sanitary products, or similar products in your toilet or drain –these items block sewer lines and cause sewer backups and overflows, which release untreated sewage into our homes, neighborhoods, rivers, and streams. FOG is a combination of Fats, Oils, and Grease used in food processing and the preparation of meals, including: cooking oil, fat, lard, grease, butter, tallow, shortening, margarine, meat, sauces, and pastries (e.g., cookies, cakes, pies, cupcakes, etc.). FOG solidifies inside the sewer system causing obstructions and blockages in pipes, ultimately resulting in sewer overflows and backups. FOG also accumulates in pumping stations and wastewater treatment/storage facilities decreasing capacity and increasing maintenance requirements and operating costs. Why are overflows a concern? Sewage overflows affect the quality of water in our streams, rivers and the Chesapeake Bay, can impact public health, and are unpleasant. Habitat for fish and other aquatic organisms is also degraded. Overflows are a significant source of E. coli bacteria in local water. If you swallow water with high levels of E. coli, you can become ill. Raw sewage also contains viruses and other pathogens. Sewer overflows also cause odors and leave unsightly sewer debris behind. Overflows are prohibited under the Clean Water Act. Are SSOs harmful? How do SSOs affect me? Sewage contains bacteria, viruses, and other pathogens/pollutants that can cause disease and contaminate the environment. When untreated sewage enters local waterways, it degrades water quality, harms aquatic life, and makes our water unsuitable for primary contact recreation (e.g., swimming, wading, etc.) or re-use without treatment. Do stormwater and wastewater flow through the same pipes? No – the City’s municipal separate storm sewer system (MS4) is an entirely separate system that carries un-contaminated stormwater and groundwater to surface water. Treatment in the MS4 is provided through a diverse variety of mechanisms under the City’s MS4 Permit, issued under the Clean Water Act. The storm sewer system is not a part of the sanitary sewer system. In contrast, many other municipalities and utilities throughout the United States operate combined systems that mix sewage with stormwater – those systems routinely overflow through combined sewer overflows (CSOs). Baltimore City has deliberated separated its sanitary sewer system and storm sewer system to eliminate CSOs. How will my community be affected by this work? Sanitary sewer rehabilitation can be disruptive to the community in the areas of the project work. First, the sewer system must be inspected to assess its condition and develop a scope of work to rehabilitate the system. Streets or lanes may have to be temporarily closed to accommodate these activities. Once a scope of work is designed, the sewers must be physically rehabilitated. Rehabilitation may require the removal of old sewer lines, the installation of new sewers alongside the old lines, cleaning, cured-in-place pipe (CIPP), or similar techniques. While there are “trenchless” technologies that minimize the amount of digging required, you can still expect openings in streets and along curbs, along with large digging and hauling equipment, and heavy truck traffic. The City is committed to minimizing disruption as much as possible, and we will communicate with residents, businesses, commuters and other stakeholders to provide advance notice of any impacts. The City operates separate “enterprise funds” for its water, sewer, and stormwater utilities. By law, these enterprise funds must be financially self-sustaining, and are separate from the City’s general fund. In contrast to the general fund, the enterprise funds are not financed by tax revenue – rather, each enterprise fund is financed by charges that are reflected on your water bill. As such, the cost of maintaining and upgrading each utility is borne by the utility’s customers, who are also the primary beneficiaries of utility improvements. Sewer improvements are also financed by low-interest government loan programs such as the State Revolving Fund and Bay Restoration Fund. The City also applies for funding through grants and other programs, including the Water Infrastructure Finance and Innovation Act (WIFIA), which is managed by the Environmental Protection Agency. Unfortunately, the amount of funding provided by the federal government in recent years has declined relative to the financial requirements necessary to maintain and upgrade our aging infrastructure. To ensure adequate funding, the City also issues debt (e.g., bonds) to pay for capital improvements to the utilities. Repayment of these bonds is secured by projected revenues for the enterprise funds. It is the result of overland, surface flooding not emanating from the Collection System. Dry Weather Overflow - a sanitary sewer overflow that is unrelated to precipitation related flows (including storm water and snow melt runoff). Per the terms of the consent decree, it is presumed that flow in the Collection System more than 72 hours after a rain event or snow melt event is unrelated to rain or snow melt. Department of Justice (DOJ) – an agency of the United States government headed by the Attorney General that represents the United States before the federal courts. The United States Attorney General is the head of DOJ. Environmental Protection Agency (EPA) – an agency of the United States government that is charged with enforcing various federal environmental laws, including the Clean Water Act. Infiltration - the water entering the Collection System from the ground through means that include, but are not limited to, defective pipes and sewer walls, pipe and sewer joints, connections, and manhole walls as defined by 40 C.F.R. § 35.2005(b)(20). Inflow - water, other than wastewater, that enters the Collection System (including sewer service connections) from sources such as, but not limited to, roof leaders, cellar drains, basement sump pumps, area drains in yards and driveways, foundation drains, cooling water discharges, drains from springs and swampy areas, cracked or broken manhole covers, cross connections from separate storm sewers, catch basins, cooling towers, storm water, surface run-off, street wash waters or drainage as defined by 40 C.F.R. § 35.2005(b)(21). Level of Protection (LOP) - The measures necessary to limit the occurrence of SSO’s to once every 5 or 10 years, respectively. Maryland Department of the Environment (MDE) – an agency of the State of Maryland that is charged with enforcing various State and federal environmental laws, including the Clean Water Act. Sanitary Discharge of Unknown Origin (SDUO) - any discharge of sewage through Baltimore’s separate storm sewer system, where the source of the sewage is unknown. Once the source of the SDUO is confirmed, if it originates from the Collection System, it is then a Sanitary Sewer Overflow. Sanitary Sewer Overflow (SSO) – an un-permitted discharge of sewage into waters of the United States from a point source (e.g., pipe, manhole, etc.) The City pays civil penalties to the State of Maryland and the federal government for each SSO that occurs in violation of the Clean Water Act. Sanitary Sewer System – the system of pipes, pump stations, manholes, etc., that is designed to convey sewage from homes and businesses to a wastewater treatment plant for treatment. The sanitary sewer system is not designed to convey un-contaminated stormwater or groundwater. Sensitive Areas - Outstanding National Resource Waters, National Marine Sanctuaries, waters with threatened or endangered species and their habitat, waters where primary contact recreation is common, public drinking water intakes or their designated protection areas, shellfish beds, and areas within one hundred (100) feet from a public recreation area, a school, a day care center, a hospital or a similar establishment with potentially sensitive populations. Structured Overflow – an engineered relief point that discharges sewage into the environment during wet weather in order to relieve pressure within the system. Overflow structures were created prior to the inception of the Clean Water Act and the EPA.